Spanish Talmudist; born at Zamora about 1460; died at Salonica 1516. In his youth Ḥabib studied the Talmud under R. Samuel Valensi. In 1492, when the Jews were expelled from Spain, he settled at Salonica, where he wrote his "'En Ya'aḳob" in the house of Don Judah ben Abraham Benveniste, who placed his rich library at his disposal. Ḥabib also availed himself of the library of Don Samuel Benveniste, which contained, among other great works, a large collection of novellæ on the Talmud by many distinguished commentators. By the aid of the works from these two libraries Ḥabib collected all the haggadic passages from the Babylonian, and many from the Palestinian, Talmud. The publication of this work began in 1516 in the printing establishment of Judah Gedaliah, the author himself carefully reading the proof-sheets; but he died just as the first two orders (Zera'im and Mo'ed) came from the press. His son, R. Levi, completed the labors of his father, but the work appeared before the public without the notes of the author to the last four orders ("sedarim"), and without the index, which the author originally intended to cover the entire work. The haggadot of the Jerusalem Talmud are also lacking. The "'En Ya'aḳob" is the only work Ḥabib left to the world. 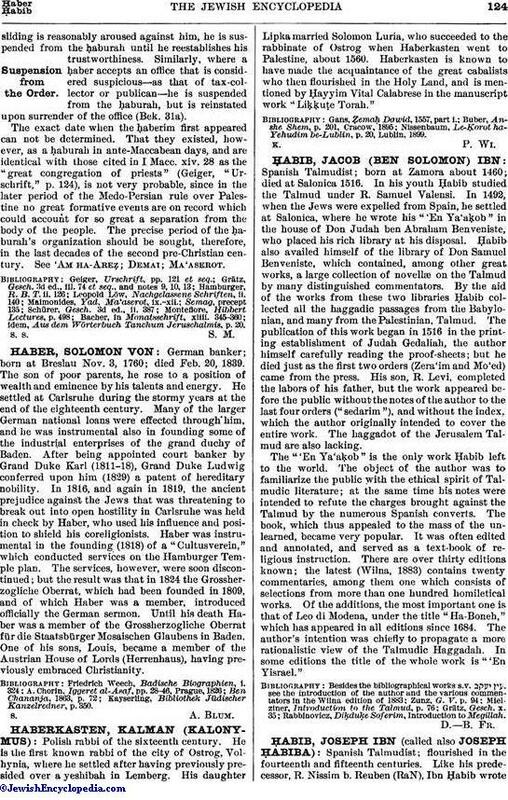 The object of the author was to familiarize the public with the ethical spirit of Talmudic literature; at the same time his notes were intended to refute the charges brought against the Talmud by the numerous Spanish converts. The book, which thus appealed to the mass of the unlearned, became very popular. It was often edited and annotated, and served as a text-book of religious instruction. There are over thirty editions known; the latest (Wilna, 1883) contains twenty commentaries, among them one which consists of selections from more than one hundred homiletical works. Of the additions, the most important one is that of Leo di Modena, under the title "Ha-Boneh," which has appeared in all editions since 1684. The author's intention was chiefly to propagate a more rationalistic view of the Talmudic Haggadah. In some editions the title of the whole work is "'En Yisrael." Rabbinovicz, Diḳduḳe Soferim, Introduction to Megillah.